Ukuleles are a great tool for teaching harmonic function and accompaniment. 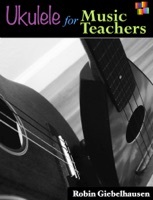 This book is designed to teach ukulele skills that can be brought to your students; consider songs that can be used to introduce musical skills; and present possibilities for arranging, improvisation, and composition. This eBook makes some assumptions about what you do and do not know as it is geared towards already practicing music teachers. This book will give you insight into the ukulele, how to read ukulele charts, and how to teach ukulele to students. It will not be teaching about basic music elements or music theory.